Unaltered from 2015 bar a graphic update, the 71 is one of eight in the Manta series, the two smallest in the range aimed towards speed rather than slalom racing. Made from the finest materials available to Tabou, the Mantas are without compromise to provide every performance advantage available. 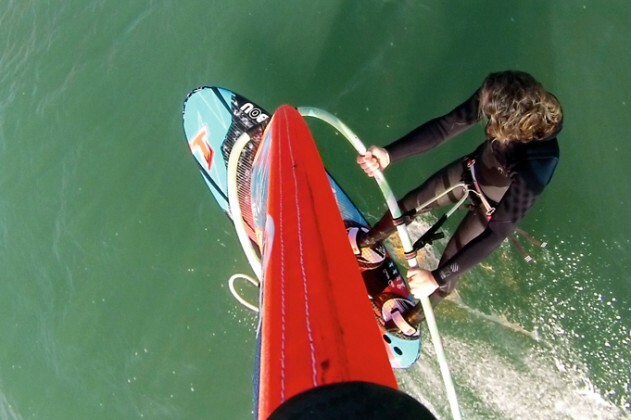 On the deck, the rounded rails level to a very subtle recess through the nose and mast track area, whilst the chunky voluminous tail incorporates a complex wingered cutout design that is fast becoming standard amongst the slalom domain. The footstraps supplied are the standard Cobra design, whereas the deck pads are thicker than on the other boards in this group, albeit with a deep cubic pattern to provide maximum traction. 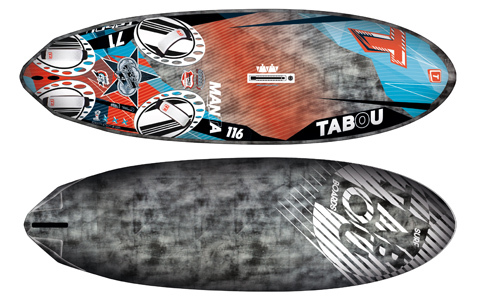 Tabou’s shaper Fabien Vollenweider is a fan of putting a large double concave under the shoulders of his boards to promote early planing (amongst other qualities), and this Manta 71 is no exception. Quick to release, it accelerates with interest and instantly feels sharp and alert underfoot. It has just the right blend of feeling directionally secure so that you can really lock it in and drive it hard, whilst remaining responsive to alterations in foot pressure at speed, able to pick your way through challenging seas. The Manta’s fin box is one of the furthest back in the group and as such the board’s character is really manipulated by the quality and size of the fin. Get the fin tuning right and the board will sit right on the surface of the water and hum beautifully; get it wrong and the Manta will have no hesitation in letting you know! It is certainly one of the more technical boards in the group to really master, but spend the time and you will have a supercharged machine with unlimited potential. Entering the gybe at full chat, we were a little surprised at just how directional the Manta felt as you tried to engage it into a turn, having felt so compact and lively on the straight. With quite a bit of volume in the tail, the board responds best with the back foot right by the back strap and as you enter your second and third gybe you realise it responds best with a firm confident gybing style, helping to lock its voluminous tail into the turn. Push aggressively and it can turn on a dime, fitting into tight corners round the mark and projecting you out at speed before you know it. The most technical in the group, the Manta is a racing thoroughbred providing a loose lively ride, which can be tamed and exploited through time spent tuning.